Wheels are getting larger and heavier. New tire systems are becoming tougher to change. Today, tire service is more challenging than it's ever been - and choosing the right tire center to serve your needs is critical. Town Fair Tires answer to this challenge - utilize the most current technology. Every Town Fair Tire utilizes the most current technology Hennessy/Coats tire changers for no-mar mounting. Our tire centers are designed to handle runflats, low profile tires, PAX tires and everything from the simplest, standard steel wheel to the largest, most delicate custom alloy wheels. 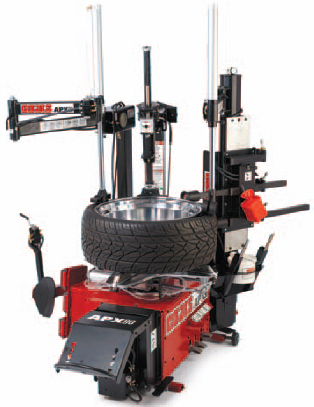 Our state-of-the-art tire changers are equipped with nylon mount/demount heads or inserts. Its precision gauges mean accurate inflation, and the X-shaped tabletop provides the right clamping pressure. What does this mean to you? Total protection for the most delicate and expensive wheels on the market! Service for wheels up to 30 inches. State-of-the-art scratchless no-mar mounting/dismounting system. On machine tire inflation monitoring for pressures up to 90psi. Certified Technicians that are trained in the standards and methods for the use of our precision state-of-the-art tire mounting equipment. Also available: rubber valve stems (non-TPMS), chrome sleeve rubber valve stems (non-TPMS), Bolt-in chrome valve stems (non-TPMS), high-pressure rubber valve stems (non-TPMS), brass high-pressure valve stems (non-TPMS). See store for details.